You are here: Home / Eyelid Surgery / Freshen Up Your Look with Eyelid Surgery! Freshen Up Your Look with Eyelid Surgery! Forehead lines and crow’s feet aren’t all that will make you look older than you really are. Droopy upper eyelids and puffy lower eyelids are two equal culprits that age the appearance of both women and men. Fortunately, eyelid surgery can address the problem and make you appear more youthful and rejuvenated. The main goal of upper eyelid surgery is to remove sagging skin and reposition excess fat to correct drooping and puffiness, respectively. 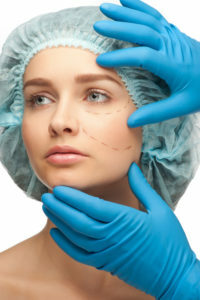 In some cases, upper eyelid surgery is done for medical purposes when significant amounts of excess skin start to interfere with a person’s vision. On the other hand, the persistent appearance of eye bags can be permanently remedied with lower eyelid surgery. Excess fat in the lower eyelid area can either be removed or repositioned through a tiny incision just below the lower lashes or inside the lower eyelid itself. Both upper and lower eyelid surgery may be done together if your plastic surgeon and the patient see the need. Look younger in just 60 minutes! A standard eyelid surgery takes about an hour and is generally performed as an outpatient procedure using local anesthesia or sedation. Bruising and swelling following surgery will most likely resolve after a week post-procedure. Call us to schedule a personal consultation today. We aim to create an eyelid surgery plan that will be uniquely tailored to your cosmetic concerns and expectations.